A Democratic Party election board representative from Manhattan was caught on camera confirming what a lot of people already suspect. It’s easy to commit voter fraud, and it’s made easier by New York’s lax voter identification measures, which really don’t exist. Breaking from his political party’s traditional stance against voter Identification of any kind, Schulkin said, “Yeah, they should ask for your ID. I think there is a lot of voter fraud.” Going further, Shulkin explained the conundrum New York faces. “You can’t ask for ID,” he said. He said mayor Bill Di Blasio’s attempt to issue voter ID’s is fraught with even more controversy. “He gave out ID cards. De Blasio. That’s in lieu of a driver’s license, but you can use it for anything. But, they didn’t vet people to see who they really are. Anybody can go in there and say I am Joe Smith, I want an ID card. It’s absurd. There’s a lot of fraud. Not just voter fraud, all kinds of fraud,” Schulkin explained. The election board representative’s comments were secretly recorded on a hidden camera by Project Veritas, the same group responsible for catching Planned Parenthood executives on video engaging in business transactions peddling aborted baby body parts for money. Activist, founder, and proponent of the Free Press movement, James O’Keefe was immediately targeted by the mainstream media and branded by liberals as a phony journalist. But without his pioneering work, the world may never have known about Planned Parenthood’s profiting from the sale of aborted body parts. Those conversations, many of which were recorded while the participants were dining, touched off a firestorm of controversy in the U.S. with many Congressional leaders calling for an end to federal funding for Planned Parenthood’s slaughter of the unborn. Despite the expose’ videos, and even with Republicans (traditionally anti-abortion) in charge of the federal budget, the 1.1 trillion dollar Omnibus spending package was passed with federal funding for the abortionists intact. Speaker of the House, Paul Ryan (R-WI), was instrumental in the Omnibus’ passage, which many believe should have excluded federal funding of Planned Parenthood. 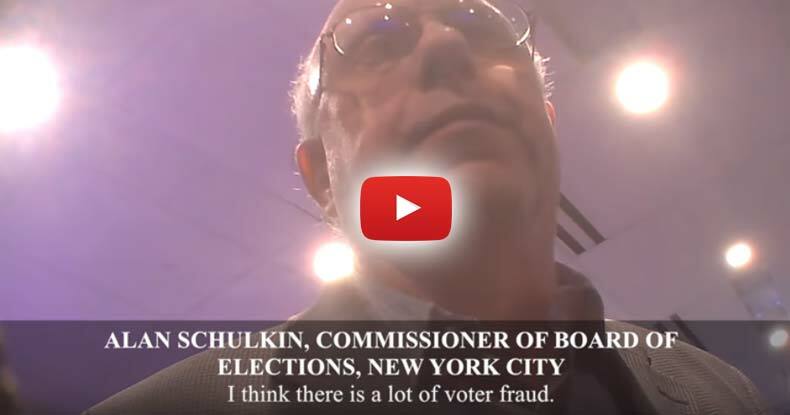 O’Keefe’s and Project Veritas’ recording of Schulkin’s comments, although they were recorded in December of 2015, serve to illustrate just how easy it is to commit voter fraud in New York. It’s a safe bet that if the Democrat representative on Manhattan’s election board knows there’s a systemic problem of voter fraud at work, then the results of this year’s presidential election will probably be wrought with fraud as well. Republicans, going back many years, have pushed for state legislatures to pass voter ID laws, to ensure elections are fair and representative of the voter base. Attempts to prevent voter fraud by passing voter identification laws (which by all accounts should be something on which both Republicans and Democrats agree) has been vehemently challenged in court by Democrats all across the country. This summer, voter ID laws in North Carolina and Wisconsin were struck down in the court system amid concerns the laws made it more difficult for minorities to vote. Similar lawsuits were filed in Ohio, Texas, Virginia, and Arizona as well, all in an attempt by Democrats to open up the polls to everyone (even illegal aliens as some allege). Some have accused the Democratic party of creating a climate whereby voter fraud is easier to commit, such as in New York as Schulkin plainly stated already exists. Also, if you wish to report suspected cases of voter fraud you may do so by contacting the federal government, your district or your state’s voter fraud divisions. A list of voter fraud contacts by state can be found by clicking here.